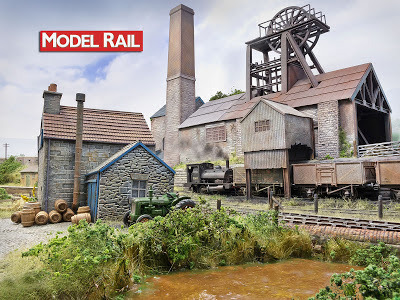 Polbrook Gurney Colliery at Model Rail Live - this weekend! 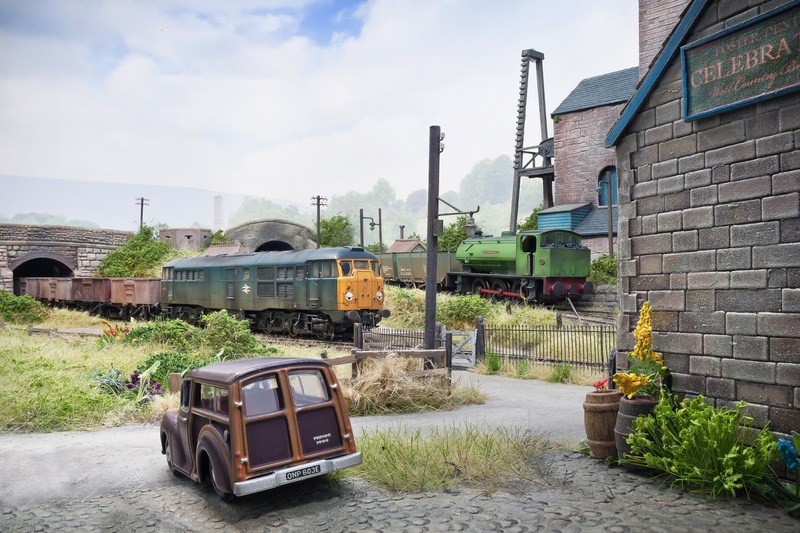 A scene from the mid-1970's at Polbrook Gurney Colliery; a class 31 by Model Rail's George Dent arrives with empties as Austerity 0-6-0 tank 'Polbrook No.2' by David Warwick prepares a full rake. This photo is not manipulated, other than the use of tools to extend the depth of field, content wise including the sky and lighting, it is all real and not meddled with - what you see, is what you get for real. 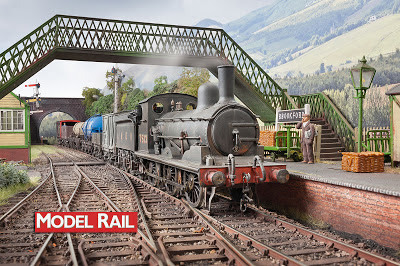 This layout will be at Model Rail Live this weekend - www.modelraillive.co.uk - see you there? On the workbench; an RT Models Contractor's tipper wagon kit. The white metal wagon is seen here before finishing and painting. For this photo the wheels will are borrowed from another wagon, the still to be bought split spoke wheels will have the pin points ground off flat. Note the 16 tonner it's parked next to for size comparison. Introducing Model Rail's exciting new publication: Great British Model Railways, Volume 1. Published on August 15th, it's a pictorial compilation celebrating some of the country's finest layouts and master modellers. 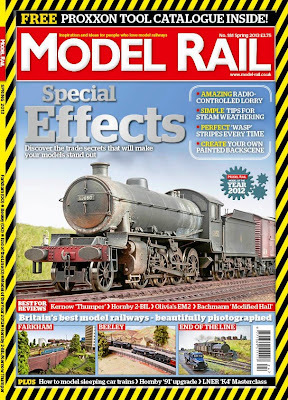 132 pages of top quality model railways and stunning photography for just £4.99. 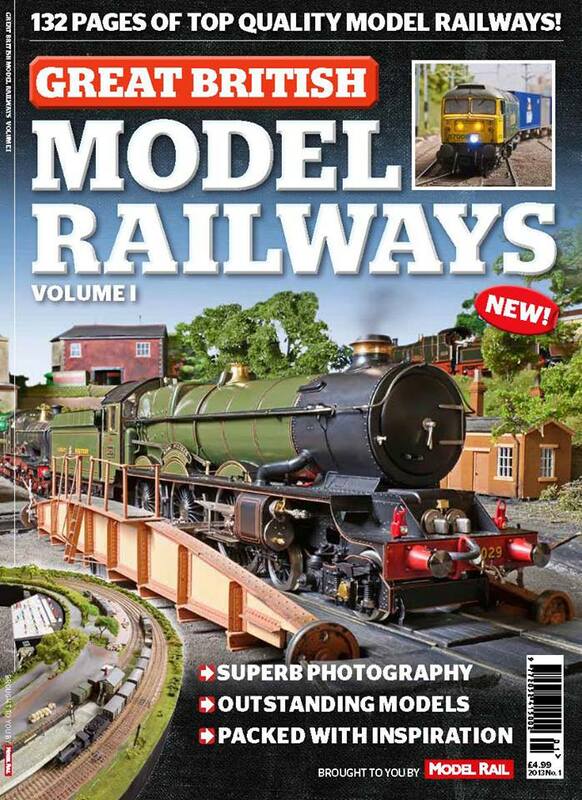 Available from WHSmith and Model Rail stockists from August 15th. Yours for peanuts, OK, maybe that plus the price of a pint of foaming, all just for £4.99! PS. It's on really nice paper too! This time of year I spend as much time outside as possible, and whilst for many the hobby pauses during the summer months, the advantage of a small layout is that it can be taken outside and popped onto the garden table allowing to continue. You also have to advantage of no electronic toys sitting on the desk in front you to distract from the job in hand. Another advantage of working outside is that you don't have to be quite as tidy as you would indoors, especially when messing about with scenic materials like static grass and coloured ground foam flocks, because a little dropped onto the lawn of not going to upset most people. Of course you don't want to drop anything that you might want to retrieve, because it will have almost certainly been swiftly thieved by a league of marching ants. Yet another advantage of working outside is great light, which can make those fiddly jobs just a little less tiring on the ageing eyes! 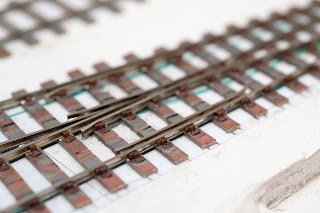 The recent warm weather also has the bonus in that the chore of ballasting sets quickly, with it only taking around an hour or so for the diluted glue and ballast to go off. With this ironstone quarry project, the high summer sunlight caused the rails to get really hot, in fact too hot to touch! A good test though, and hopefully one that has given me confidence in the track will not buckle in a hot smelly exhibition hall - should I take this mini-layout out on the road that is. 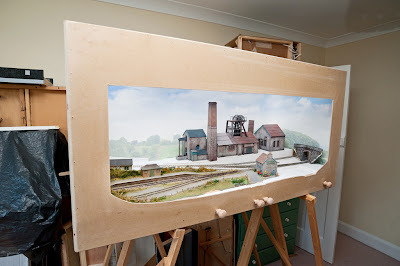 The above photo shows that the ironstone quarry project is looking pretty complete, and to the sceptics that think all model railway layout photos are just 'Photoshop', in this shot there is none - the backscene being a wrap around print which runs right around the rear of the layout in a large arc. There is still some detail and a little scenic work to do, and I also need to mess about with some suitable wagons and maybe locos. 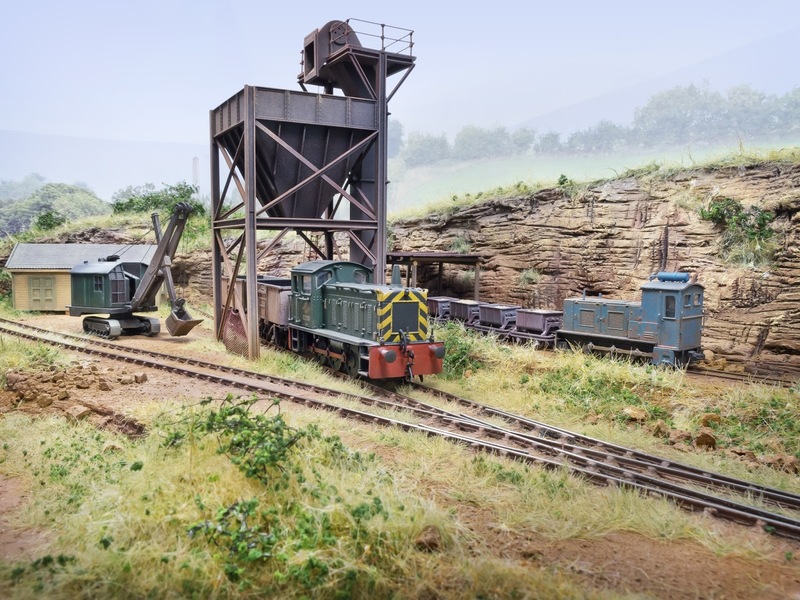 As part of the operation, the plan is to load the empty wagons via the loading hopper with real loose iron ore to add to audience interest - or more likely amusement. The lighting rig also needs to be built, for this photo I used my studio lighting, but the plan is to have the same quality and colour of light as in the photo. Linking back to the opening paragraph, regulars will notice that I don't blog here quite as much as in the past, the reason being that I'm often too busy doing real life things rather than sitting in front of a computer which can be very unproductive. I call these computer free-periods 'Analogue Days', I enjoy these because a lot of model making can be carried out, which very much proves what slaves we all are to these useful but dreaded machines, which can be like blotting paper to spilt ink. Unlike hanging around on forums , I do still like to go to the pub to enjoy a few ales, without the car of course, but I certainly won't be using the 'Free Wifi'. 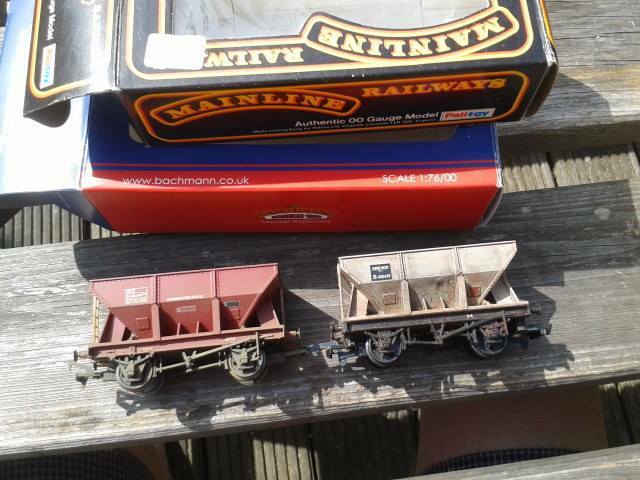 A couple of free wagons from Model Rail's Peter Marriott. These will be ideal for the ironstone project after a little work. 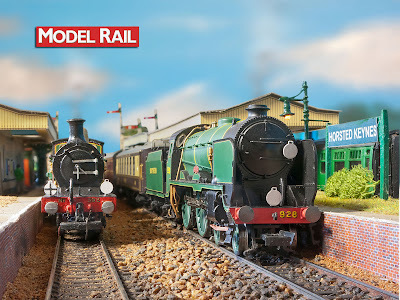 Not all will know that the current Bachmann offering dates back to Mainline of the 1980's. The current version (brown) has much better chassis tooling. The old one will need some fettling to match. I think I have some white metal brake rigging castings that can be spliced in. Of course I could buy a new one. But that rather defeats The object. 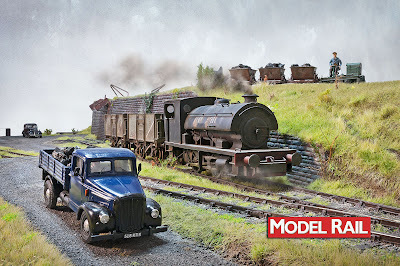 A few weeks ago I posted Vobster, a little mini-layout to make use of Polbrock's old diorama case, baseboard and backscene. 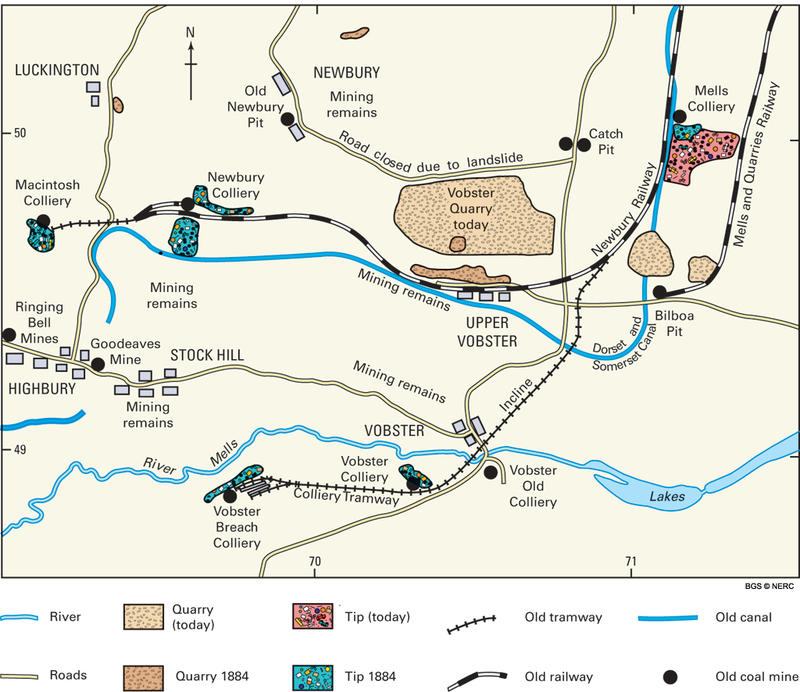 I possible idea was a quarry off the Highbury Railway near Frome, but after a visit to the High Dyke area of South Lincolnshire known for its now defunct rail served ironstone quarries, I have settled on a little known part of the Buckminster system off High Dyke. A couple of weeks ago having a good poke about in the area and I even found some iron stone in what was Colsterworth Quarry - much of which has been smashed up and sprinkled everywhere on this little scene here. The hilly landscape south of Grantham is not too dissimilar to the backscene inherited from Polbrock (the little GWR halt that used to be here having moved into Polbrook Gurney - "confused? You will be"), though I will need to add some shrubbery to hide Cornish Engine on it! The loading/hopper is a Wills Coal Loader that's been kicking about on my bookshelf and was in need of a home. 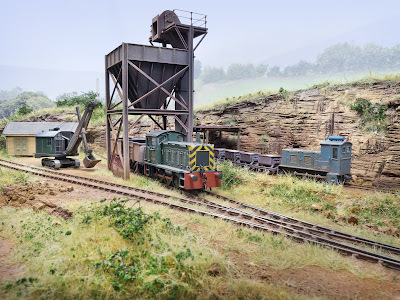 Usually the narrow gauge tipplers would have been tipped straight into the standard gauge wagons, but my excuse is that the occasional use of taller ex-LNER 20T hoppers required this installation. 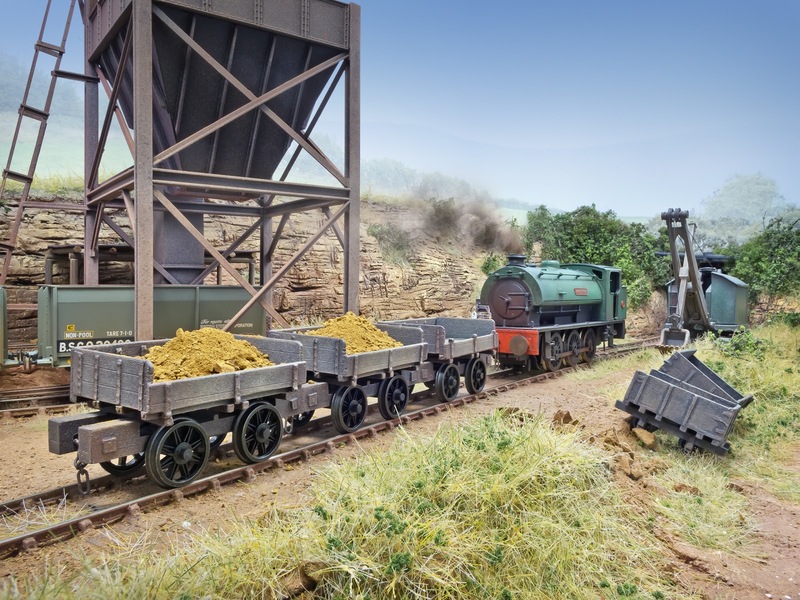 The plan at shows will be to actually load wagons with loose mineral - probably simply spoon fed from above the hopper/loader. 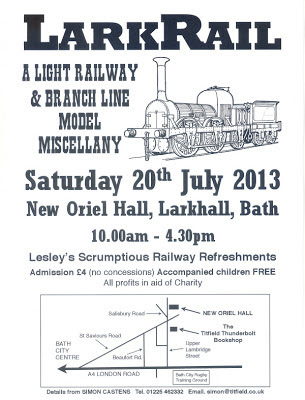 Polbrook Gurney will made a rare visit to the Bath area on Saturday 20 July at Larkrail. 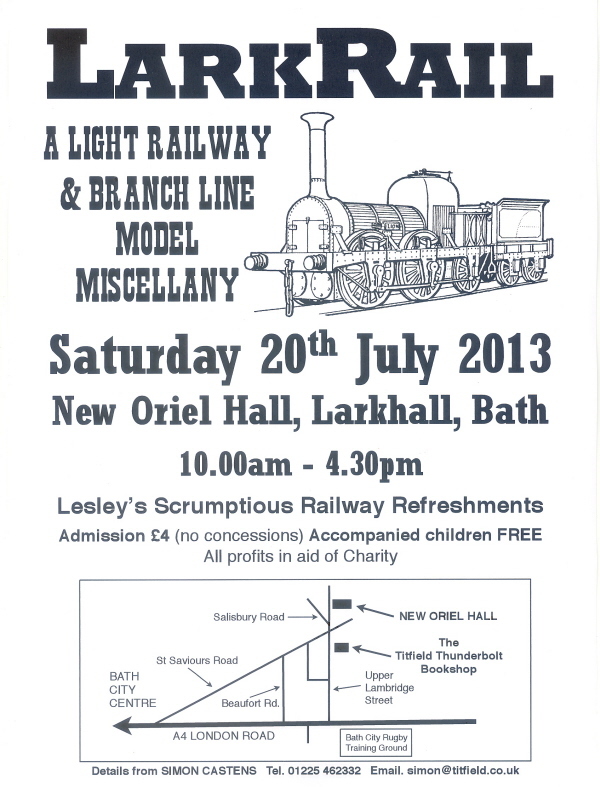 Larkrail will take place on Saturday the 20th July 2013 at the New Oriel Hall in Larkhall on the east side of Bath. Opening times 10.00am to 4.30pm. Messing about with ideas, taken on a cell/mobile dog and bone. Messing about with Polbrock's old diorama case, backscene and baseboard. Possibilities could be an a couple of dead end sidings with working narrow gauge serving standard gauge. 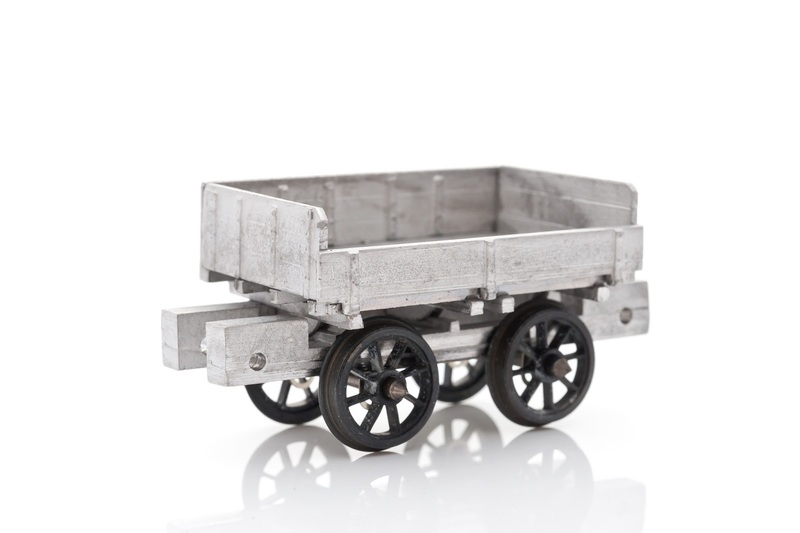 I want to have actual wagon loading as its feature filling up wagons with loose aggregate or minerals as its 'feature'. Should be a very quick project. Just need to build the track and scenics. 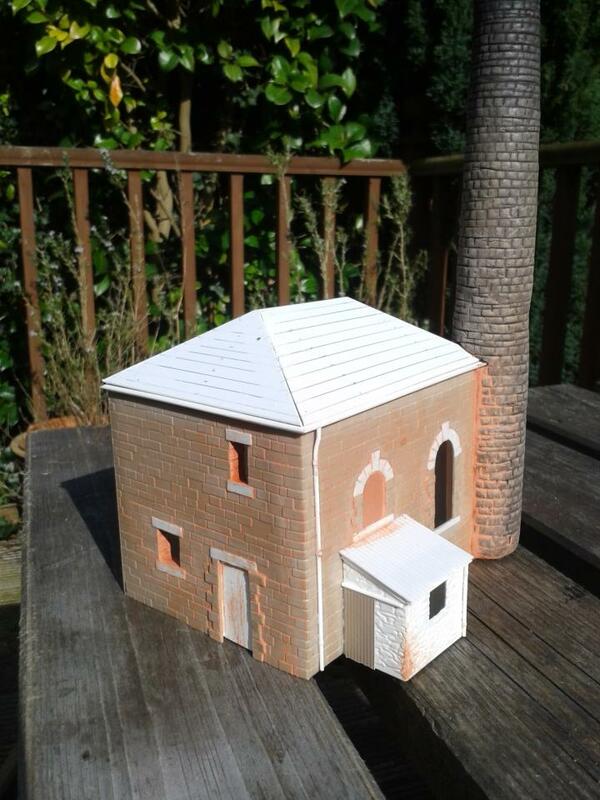 I've enough stock and buildings kicking about and of course the carpentry is done. News: Growing layout list for Model Rail Live. Computer design images of exclusive 'USA' 0-6-0T model. Build a real timber shed. Today I'm packing up and getting ready for Railex www.railex.org.uk this weekend, for which will be Polbrook Gurney's first outing. Here's an un messed about snap of the right hand side of the layout and the brewery at the back of the Pedant and Armchair on Polbrook Gurney is working hard by the look of things, I just hope they're not using the orange iron pyrites stained water which will have been pumped out of the mine. 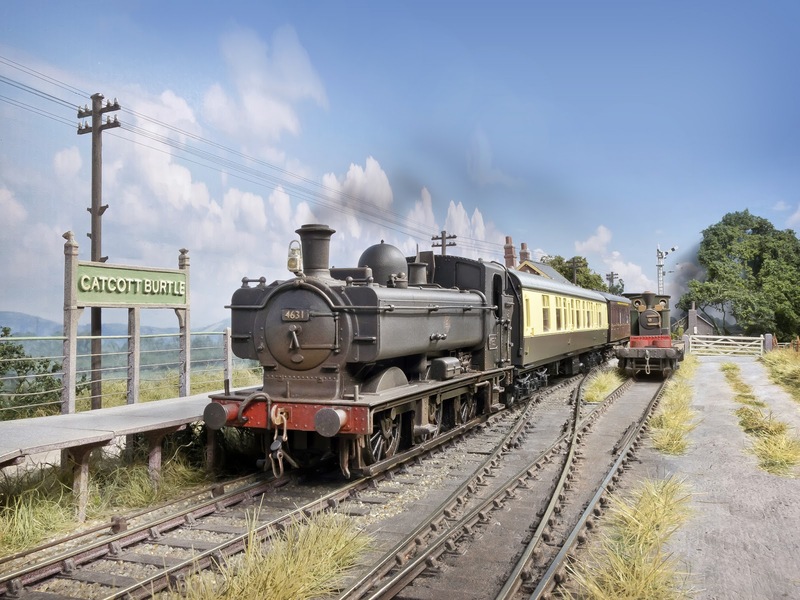 Templecombe's ex-GWR Pannier tank No. 4631 is captured near the colliery weighbridge through a long lens in 1961. Until 1833 this area used to be a canal basin, it was later drained and laid as a 2ft 8 inch gauge dramway, and the canal tunnel seen in the background could be used for railway purposes. 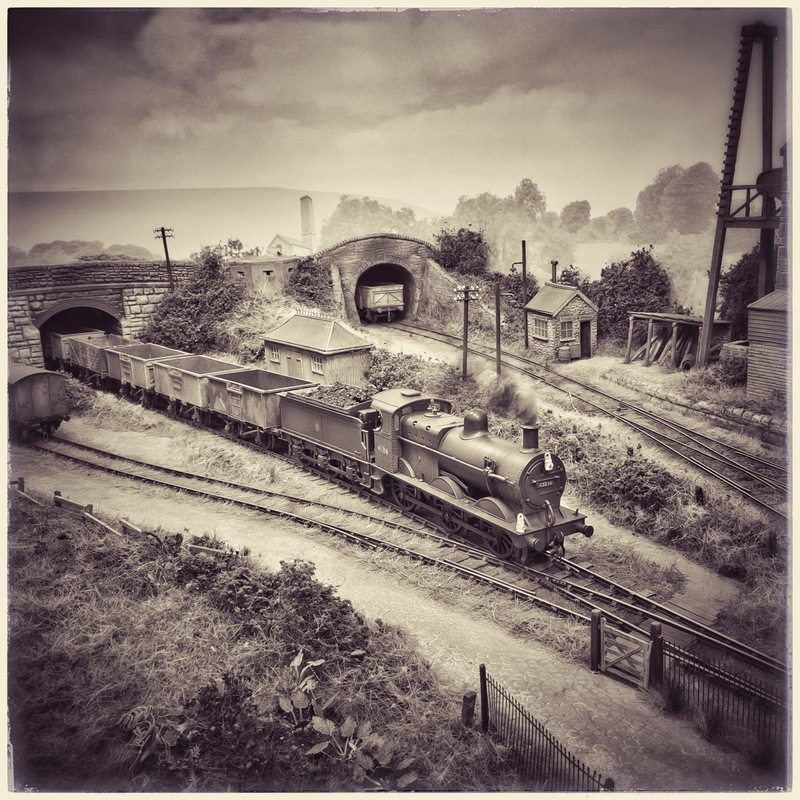 In later years when the GWR (Binegar, Nettlebridge Holcombe and Vobster Light Railway) came though 20 or so feet lower than the colliery railway on the right, the whole location was transformed which included replacing the narrow gauge with the British standard gauge of 4ft 1 inch. There were rumours that some silly gauge of 4ft 8 an a half might be adopted, this never happened of course. 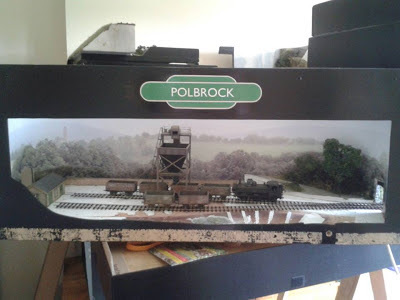 Polbrook Gurney Colliery Update - running trains! nevard_130514_PGCH_IMG_3911, a photo by nevardmedia on Flickr. Polbrook Gurney Colliery: this afternoon was spent running trains to see how it would all work. I decided to add a couple of extra isolation sections to make the operation more flexible and interesting. Not relying on fishplates for electrical continuity makes this easy because it's just a matter of splicing in a toggle switch into the sub baseboard electrical circuit which provides the electrical continuity between sections of track. A 5 minute job. This high level view is roughly what a 6 foot high operator will see from the front, the curved backscene and bright even built-in illumination being great for photography like this. 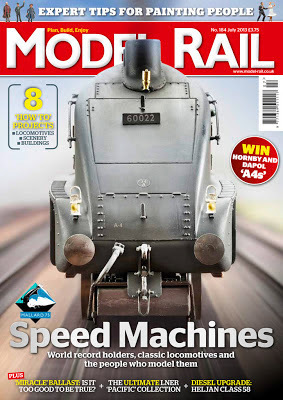 I'll be covering the above in detail, along with the construction of the new buildings and scenics in forthcoming Model Rail magazines issues. nevard_130511_PGCH_IMG_3837, a photo by nevardmedia on Flickr. Model Rail Live announcement - new venue. nevard_130508_PGCH_IMG_3807, a photo by nevardmedia on Flickr. With RAILEX just 2 weeks away finishing touches are taking place, starting with the the screen area behind the loco which was given a good dusting of real coal (found near Shillingstone on he former SDJR) which had been ground up with the kitchen pestle and mortar and then sieved into place with the kitchen sieve (don't tell my wife). The whole lot was then spayed with diluted PVA (white glue) to fix into place. Then when the above was dry, the track was cleaned and I gave the layout a really good run using a wide range of locos, ensuring that there was no stalling or jerkiness caused by the track or incorrect back to backs. A few spots needed the paint removing from the inside of the rail heads. The shot here is unmanipulated, and shows to advantage of the high warp around backscene a real bonus for photography. 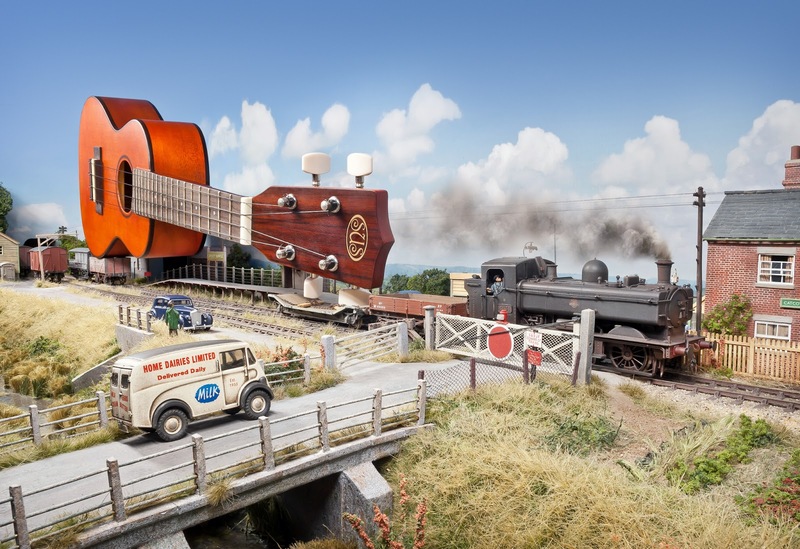 Note the narrow gauge tramway above one of the fiddle yard exit points. A few extra hours were grabbed today unexpectedly which means that I've managed to pull the replacement of the engine winding house forward to before Railex which is just 3 weeks away. This one has shades of Ludlows Colliery in the centre of the Radstock. As usual time is the limitation and will always dictate how much time I can dedicate to a project, but I can always go back at a later stage as needed. Apart from the chimney which is a previous bit of slap dash messing about, this is about 4 hours work with foamcore, various plastic sheets and a little Das. I've since started on the roof since grabbing this snap on the mobile; which despite limited time is going to be individual slates applied from small overlapping squares of junkmail. Tthe shiny finish of such being ideal for taking paint; today the junk mail donour was some irrelevant PAYE material which we keep being sent. 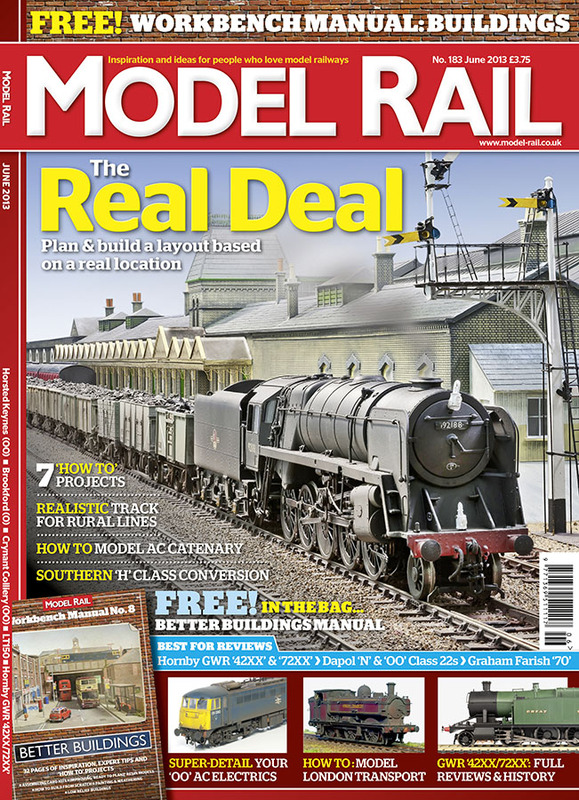 Follow at detailed construction of Polbrook Gurney Colliery in Model Rail magazine. nevard_130424_PGCH_DSC_5860, a photo by nevardmedia on Flickr. T minus just over 4 weeks, here is the state of play. Lots to do, for starters the pub needs a rear and the smelly pond needs something wet and smelling in it. Maybe I should wait until Railex and wring out one of the whiffers and drain it/him into the pond? The chimney, wasn't really needed, but old collieries had all sorts of physical redundant links with the past and I wanted to see what could be done with 4 sheets of A4 printer paper rolled up with plenty pf PVA into a cone, a layer of Das followed by a quick manipulate with various items more at home in the kitchen and then popped into the oven for 30 mins at 150 c to dry out the Das. It's far from perfect, pretty rough actually, but hopefully it works, and more importantly for me was a quick fix. All in all, apart from drying was around 2.5 hours work. nevard_130418_PGCH_IMG_3501, a photo by nevardmedia on Flickr. Build 2 fiddle yards (with split height rail access for the different exit points). Build the rear of the pub which previously was up against a backscene. Hope the drape I use for all layouts will (should be fine) will fit. Hope it fits in the back of my old Mondeo with its 2 foot high backscene (a tape measure suggests it will). nevard_130415_PGCH_IMG_3495, a photo by nevardmedia on Flickr. Today the static grass came out, three layers (various makes) working from greens through to straw shades on top. The grass on the track will need a little trim - that's where a fresh disposable razor comes in - just draw it along the rail tops. The first tree is in, it being salvaged from Polbrock. More will run along the rear in a random fashion along the lines of an over grown hedgerow, but without over crowding the scene, I like the feeling of space. 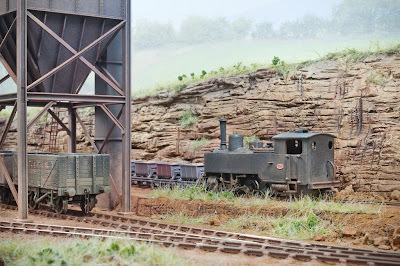 "An ex-L&YR 'Pug' propels a short rake of wagons up the gradient toward Polbrook Gurney Upper Pit. The Cornish engine can just be seen beyond the bridge. 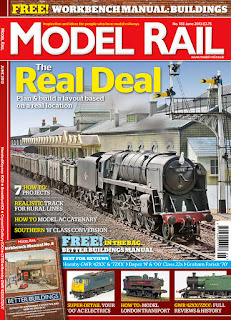 I'll take you through the construction of this layout in Model Rail magazine, starting a new series from the May issue which is on sale from 18 April 2013. 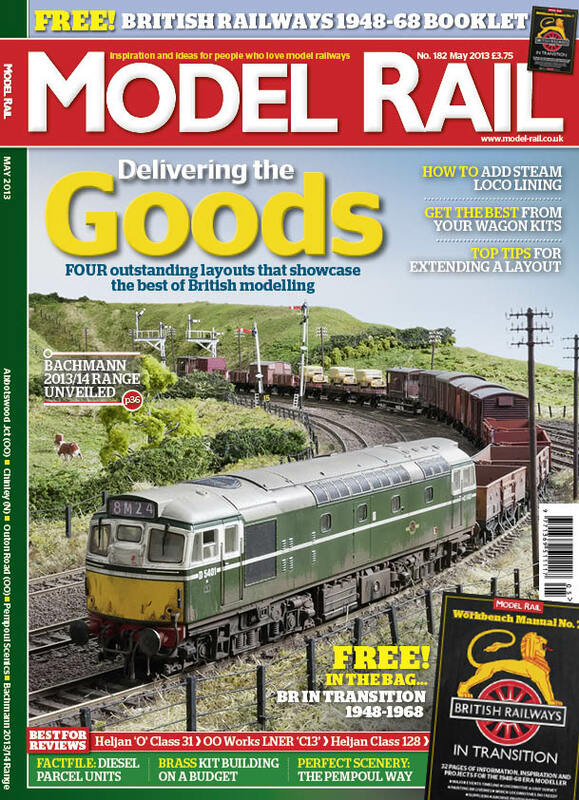 FIRST REVIEWS: Heljan Class 128 parcels unit, Heljan 'O' gauge Class 31, OO Works LNER 'C13' 4-4-2T, plus the latest books, tools and accessories. 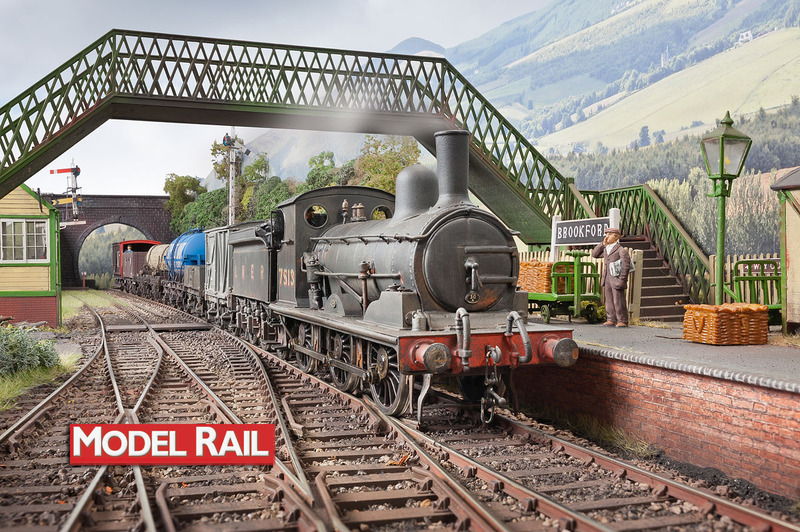 WORKBENCH: Rebuilding a layout, Making the most of a Parkside Dundas wagon kit, How to paint lining, how to weather 'N' gauge stock in just 15 minutes, better 'N' gauge couplings, and more. PLUS: Workbench Manual No. 7 – British Railways in Transition. 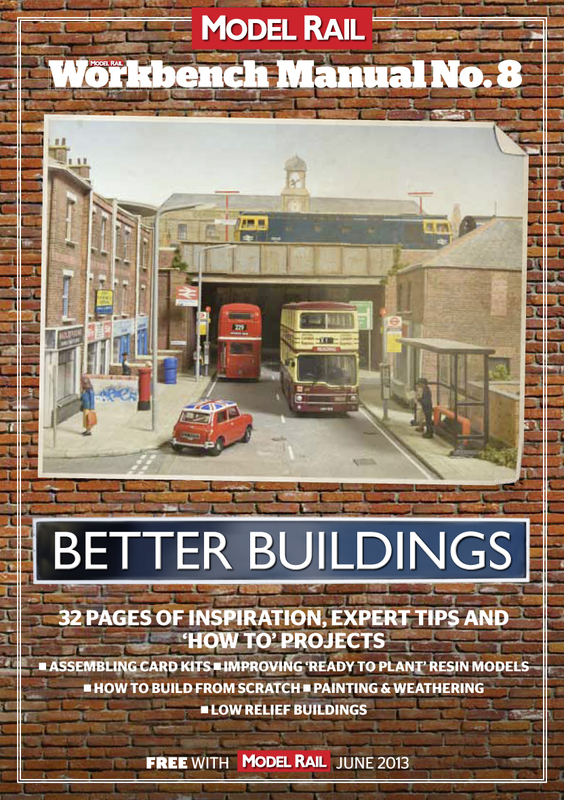 A FREE 32-page look back at the 1948-68 era packed with superb archive photographs, background information and 'how to' articles. 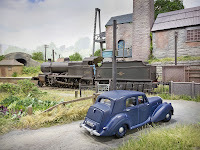 Abbotswood (OO) late 1960's early 1970's junction based on a real location in Worcestershire where you'll be able to enjoy a good mix of 'heritage' diesel motive power and trains in green, maroon, blue & grey and other such period delights from this rarely modelled era. 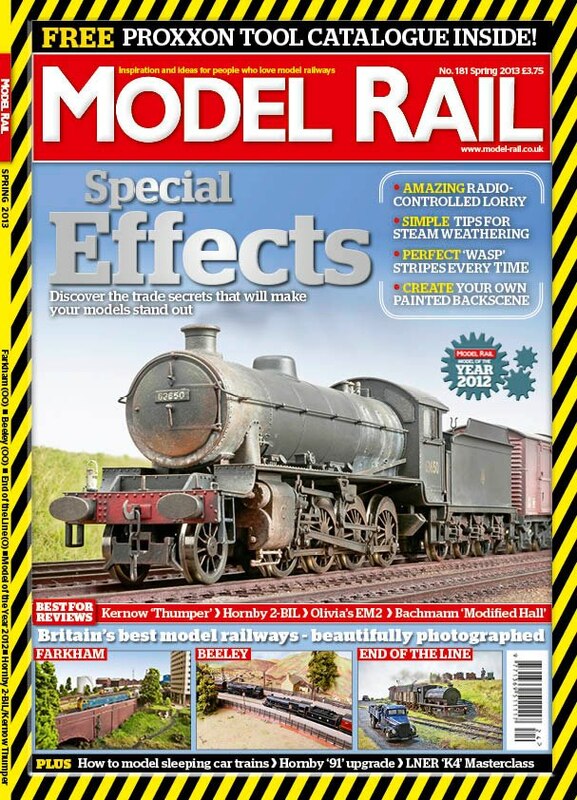 This super new layout which premiers in Model Rail is also featured on the cover. Chinley (N), we wind the clock back to 1950's Derbyshire, to enjoy an exclusive first time viewing this extensive loft layout, again based on a real location. 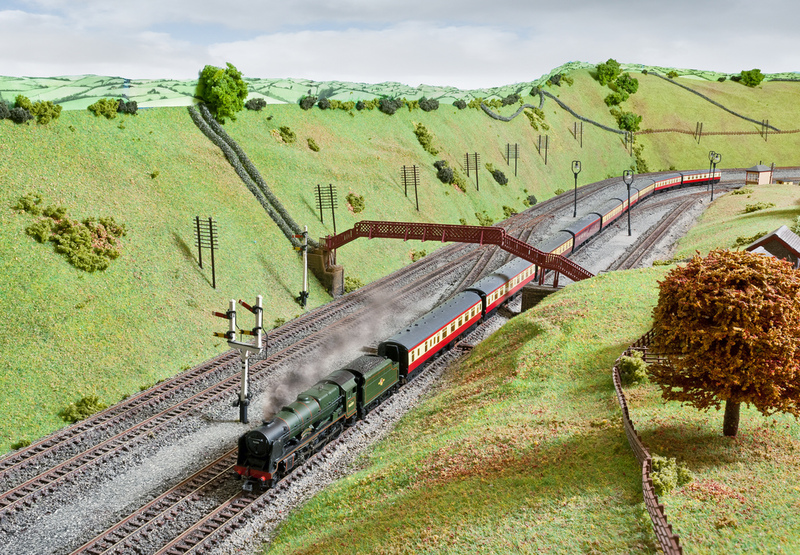 N gauge allows the capture of this well known Peak District station and environment to full effect with long passenger and goods trains in a big landscape. Outon Road (OO), we re-visit this classy 1990's era layout to experience yet more of Cavan Millward's fine workmanship, which doesn't only involve extending the layout but also includes the addition of overhead catenary along with more of some of the best scenic modelling out there. 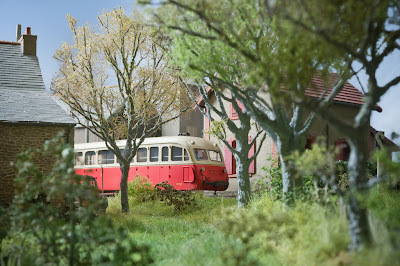 Pempoul (1/50), Maggie and Gordon Gravett's iconic and hugely popular French metre gauge layout will be known to many. 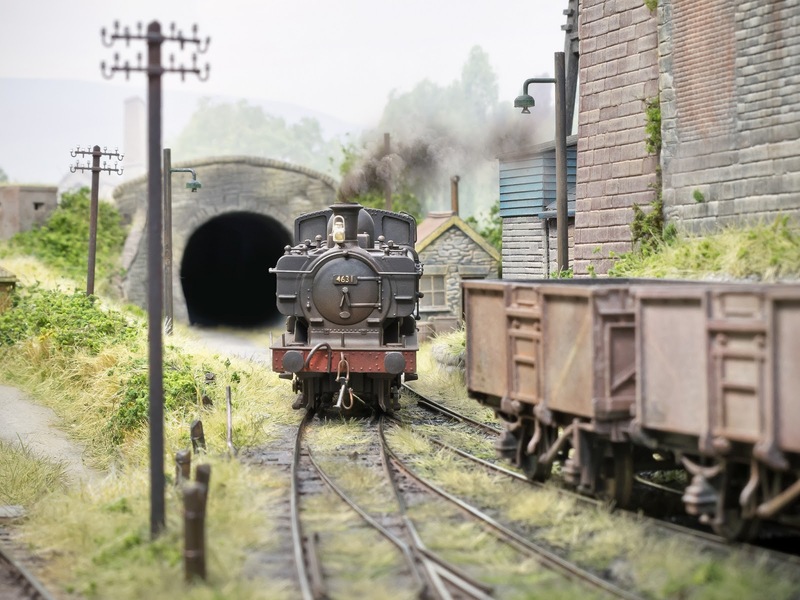 But for the first time ever we undertook a proper controlled shoot under studio lighting conditions to gain another angle on this wonderful layout, whilst giving the builders a chance to reveal some of Pempoul's scenic secrets. To subscribe follow this link. nevard_130401_PGCH_IMG_3271_BW, a photo by nevardmedia on Flickr. The difference between the heavier traditional British bullhead track in the foreground contrasts nicely with the light weight colliery flat bottomed rail sidings. nevard_130319_RNAD-99HP-B-D_DSC_4907, a photo by nevardmedia on Flickr. 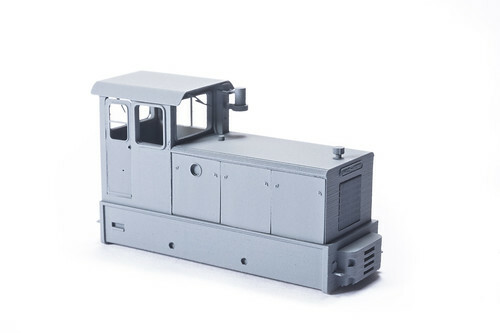 On the build review workbench today for Model Rail a 3D printed narrow gauge RNAD 99hp Baguley Drewry by Narrow Planet. These perky little locos were in use at the MOD Dean Hill complex until recent times on the military narrow gauge network that existed there. 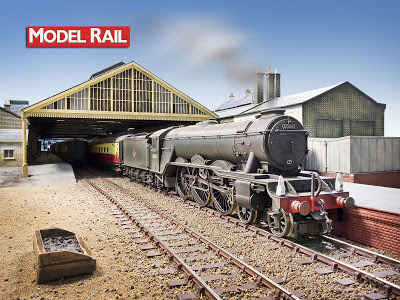 A full build review will appear in Model Rail shortly. Plus news, exhibition diary, Backscene etc. Each year Model Rail magazine, RMweb and MREmag join forces to ask modellers to vote for their favourite models of the preceding 12 months. The results of the latest poll, are published today. 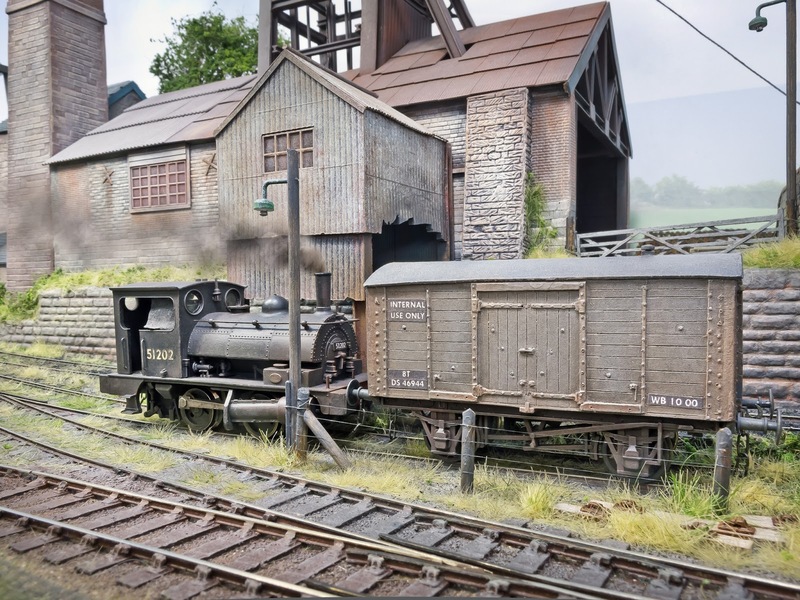 Dapol marked its first venture into ‘O’ gauge modelling with an award for its new coal wagons and Ixion’s brave venture into RTR ‘O’ gauge industrial locomotives was acknowledged too. 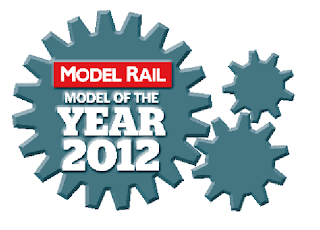 A delighted Chris Klein of Ixion Model Railways said: “Lindsay, Phil and I are thrilled with the award and thank everyone who voted for us. 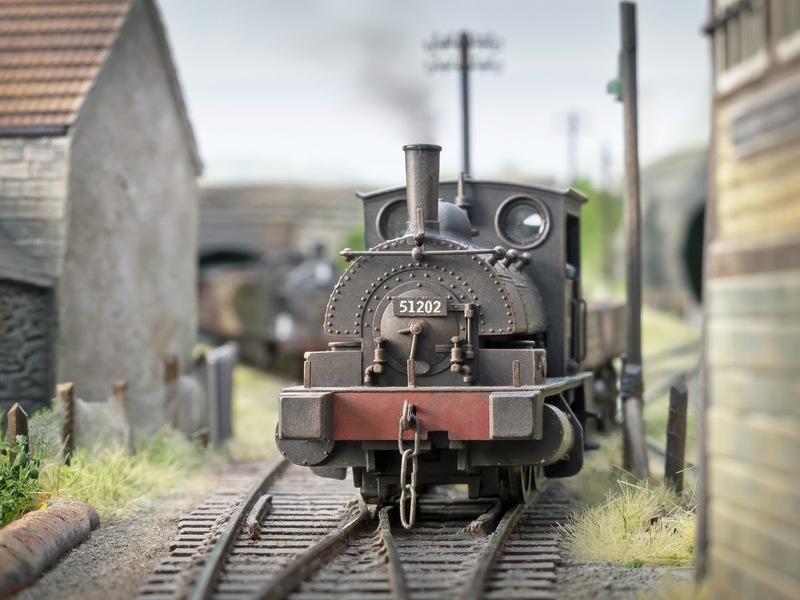 We wanted to produce a high quality, economically priced model that would attract people to the joys of ‘O’ Gauge and judging by the Hudswell Clarke’s ubiquity at exhibitions and this award, we believe we have achieved our aim." 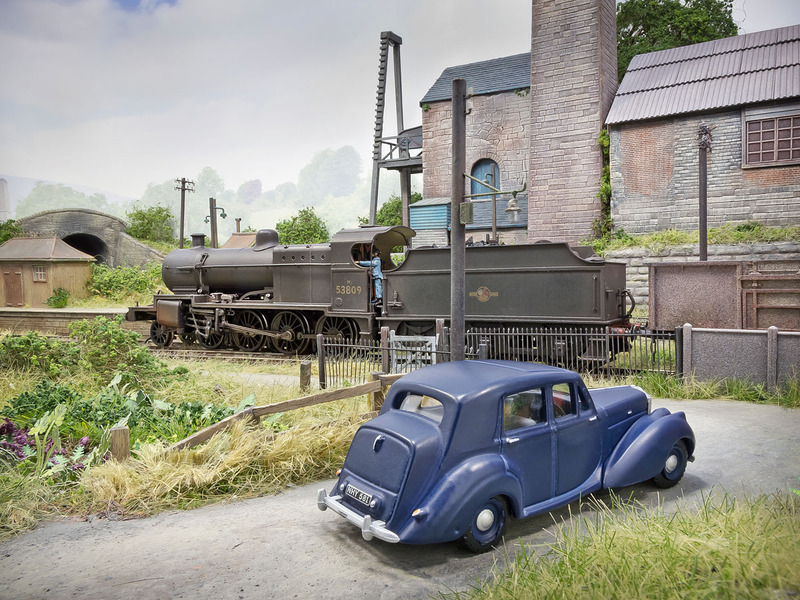 As predicted, Bachmann’s ‘Midland Pullman’ DEMUs in ‘N’ and ‘OO’ won their categories by a landslide, but the company’s ‘OO’ gauge Wainwright ‘C’ Class 0-6-0 was perhaps a surprise winner in front of Hornby’s LNER ‘B17’. 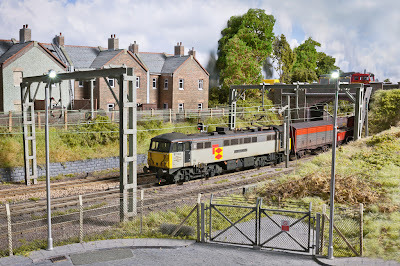 The success of Bachmann’s Class 85 electric ahead of the Hornby Class 67 was also unexpected. Both claimed almost double the vote of their nearest challengers. 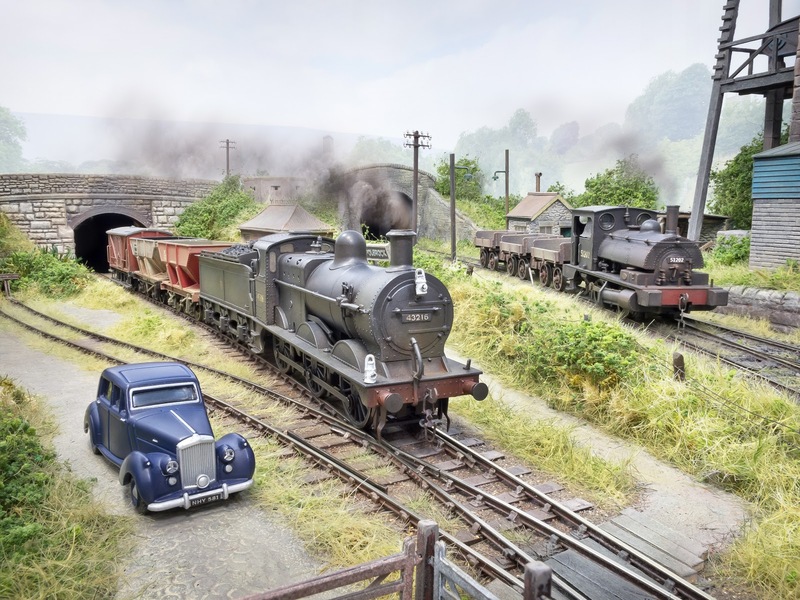 In ‘N’ gauge, the Graham Farish ‘WD 2-8-0, new Class 20, SR ‘Pillbox’ brake van and LMS Inspection Saloons proved particularly popular with voters, and the brake van was also a strong winner for Bachmann Europe in the ‘OO’ wagon section. 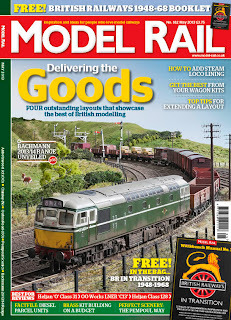 The full list of Model of the Year 2012 awards winners is published in the Spring issue of MODEL RAIL magazine, on sale Thursday March 21st in all good newsagents and model railway shops. Also available for iPad via iTunes. nevard_130317_PGCH_DSC_4882, a photo by nevardmedia on Flickr. As part of converting Polbrock into Polbrook Gurney Colliery, sadly the level crossing had to go, the higher level of the new adjacent headshunt and sidings rather negating its usefulness. Luckily removing the checkrails and picking out the Das modelling clay the road surface was metalled with was an easy task, with ballast taking its place in due course and maybe a small foot crossing from old sleepers to allow access to the halt. The pub will remain 'as is', despite suggestions that it should be renamed from the 'Pedant & Armchair' to 'The Miners Arms'. The 'Pee and Aee', as it's called by its regulars provides a useful place for those irritating people we all come across at shows and internet forums, giving them somewhere to go during the week when not in care and when the forums fall over from time to time. Also today, a couple of hours was spent applying cosmetic chairs to the new bullhead rail/copper clad built point that links BR with the colliery - a fiddly job, but one that is important seeing so much effort was put into the original Polbrock track work which uses C & L components. With time being so short before RAILEX at the end of May, I was tempted not to do this to save time, but the couple of hours required to file the chairs down so they could be superglued onto the copper clad sleepers was well spent I think. Regulars to this blog, will notice that yet again I have not been posting here quite as much, this is not due to lack of activity, but simply down to the fact that these days I don't sit in front of the computer quite as much twiddling my thumbs. However my Facebook 'Like' page at www.facebook.com/chrisnevard gets daily updates that don't take as long as writing a blog post, because such can often be performed from my mobile/cell phone when on the fly, many of which are small progress reports on various project that maybe don't warrant a whole blog update. nevard_130226_Polbrook-Gurney_WEB, a photo by nevardmedia on Flickr. 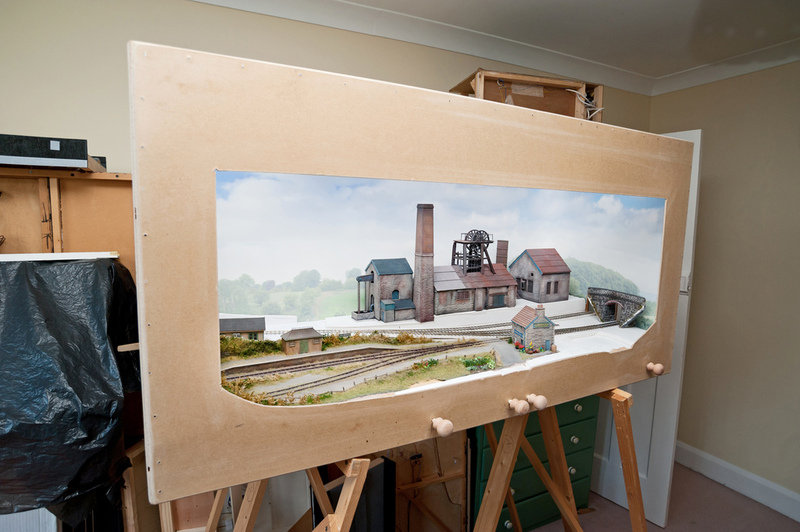 I'm currently working on the backscene for Polbrook Gurney Colliery (see link to right) which will be light, misty and distant. The original is 7 x 2ft and will feature wrap around the ends thus avoiding sharp corners in the sky. 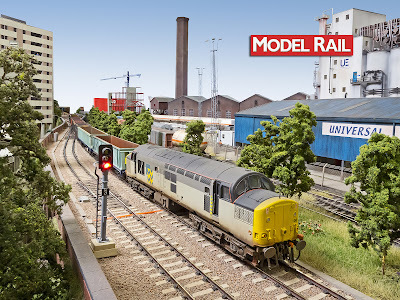 It has been created photographically as per my recent feature in Model Rail magazine. 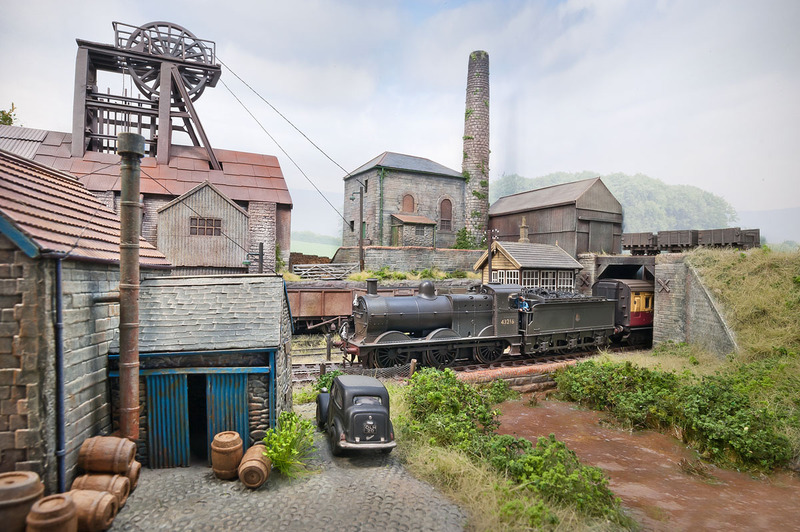 2ft is quite high, to me this is important which means that photography, even when looking up at the colliery buildings you'll still see the backscene behind the layout rather than room the layout is in. 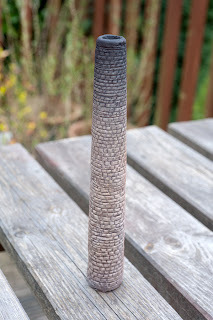 This combined with bright even neutral illumination (yet to be decided, but it won't be spots which are dreadful!! LED might be an option btw.) should give a good airy spacious feel which hopefully will disguise the 4 x 2ft footprint and fool people into thinking the layout is much bigger. Deadline, end of May at Railex! Polbrook Gurney Colliery will shortly be featured in far greater detail in Model Rail magazine.